Willie Park, Willie Park Jr., Willie Park and Willie Park Jr. Established in 1896, Murrayfield Golf Club’s first course was a 12-hole affair situated half a mile east of its current position. This layout didn’t last long because the club soon moved to its present location, with members playing on a full 18-hole layout. We’re not sure of the exact date that this happened and we’re also not entirely certain of who designed the new course but, according to sources we’ve looked at, we think that Willie Park Junior and his father were responsible for the layout. 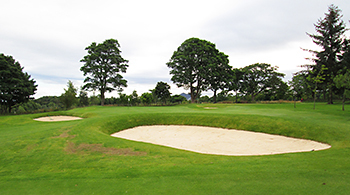 Assuming the design was indeed a joint effort from the Parks, it occurred at a particularly productive time for them, as they collaborated on a number of Scottish golf course projects at the time, including Duddingston, Innellan, Lauder, Torwoodlee and Glasgow Gailes. In the book Willie Park Junior, The Man who took Golf to the World by Walter Stephen, it’s stated: “Murrayfield was on Willie Park’s list of courses planned or revised by himself, but in the opening pages of the club’s official history no names are mentioned in connection with the initial layout and early modifications”. The author continues: “However, Willie Park did play an exhibition game there in 1899, just about the right date for an official opening.” On page 149 of the book, he lists Murrayfield as one of thirty three Scottish courses that Willie Park Junior had been involved with as an architect. In 1904, the course measured all of 4,930 yards when Harry Vardon and James Braid (who had between them finished either first or second in the previous nine Open championships) played another exhibition match, one that attracted many thousands of spectators. Today, the layout extends to a modest 5,781 yards from the back tees, where par is set at 70, thanks in the main to having only two par fives on the card (at holes 14 and 18), though a solitary par four in excess of 400 yards also contributes to a lack of length. On the front nine, the uphill 8th (“Law Park”) and right dog legged 9th (“Forth View”) are delightful back to back short par fours whilst, at the start to the inward half, the 194-yard 10th (“Old Quarry”) is a spectacular downhill par three that never fails to get the pulse racing. Murrayfield’s short but sweet. Very sweet, in fact. The opening three holes rise steadily away from the clubhouse in the same direction, before the routing turns around and a lovely downhill par four plunges back downhill, with the city centre skyline as a spectacular backdrop. This hole’s followed by a terrific six-hole stretch, beginning with a thrilling uphill par four at the 5th, where the approach shot is played blind through a narrow gap in a ridge to the green. The downhill par three 7th is another fabulous hole - the green protected by a bunker front right with two traps on the left - but it’s made to look rather ordinary by comparison when you arrive at the long par three 10th, played from a precariously positioned platform at the edge of a cliff face, where the tee shot plummets a long way down to a rather distant green. I thought it a little reminiscent of the lochside 14th hole at The Carrick, one of the top par threes in Scotland, so that’s an indication of just how good this hole is. My back nine notes also make mention of the quality of the fairway bunkers on holes 12, 15 and 17 and that’s probably because I was unable to avoid one or two of them! The final hole has a pronounced right to left slope in the fairway and it’s one of only two par fours from the regular tees that measure in excess of 400 yards. Although it’s downhill all the way to the home green, the fairway camber means getting on in two shots (which you should be able to accomplish at all the other par fours) is no easy matter. Playing the last hole as a par five adds almost 100 yards to its length so attaining a par from the medal markers is just as difficult. I understand that club membership is almost at a maximum, thanks to a substantial increase in numbers over the last year, which is a very healthy position for Murrayfield to be in. I also hear the club is hopeful of hosting regional and/or national junior, senior and ladies events in the future and that can only benefit both the profile and reputation of a course that deserves far wider recognition than it currently enjoys.